I have a love/hate relationship with Catholic Radio, 101.7. Does anyone else ever listen to this station? Probably not. But I do! What I like is they have these phone-in shows I have gotten hooked on. One is "Catholic Answers," where they invite anyone to call in with questions about Catholic laws, dogma, liturgy, whatever. They always laugh a lot listing all these things. Then they have "Calling All Catholics." That is more an in-house thing. With "Catholic Answers" you get atheists and Protestants and whoever. The way they run these shows, they put this priest behind the microphone who is usually some kind of convert and is ready to defend the Church on anything. The priest's answer always boils down to why the Catholic Church is right and everyone else is wrong. I always enjoy conversations like that. So I like that. What I do not like is all the cruddy music. Guitars, New Age, kind of a watered-down folk music, and sometimes rock, where you can't even understand the words. I cannot wait until Pope Benedict blows the whistle on all this stuff. He is trying to do that. Here we are with all these great Catholic composers from Palestrina all the way up through Mahler and Messiaen and what do we play? This junk. And what about Gregorian Chant? If chant is supposed to be so popular how come 101.7 never plays that? I ask you. For that matter, why don't they play Leonard Pennario? But here is something I love about this station. It sometimes takes you back in time. A few weeks ago they had this bishop on one of the shows, and the moderator was taking questions, and the bishop was answering them. The bishop was in the middle of an answer when he asked the moderator something. "Uh, Joe, can you clarify this?" he asked. "Joe, did you understand what the caller was asking?" the bishop said. Suddenly the moderator came to life. "I'm sorry, Your Excellency, I was distracted," he said. "I'm sorry, Your Excellency, I was distracted!" What a privilege it was to hear something like that, in normal conversation, in the course of an ordinary work day. I felt as if I were back in Mozart's time! And here is something better in the time-maching department. 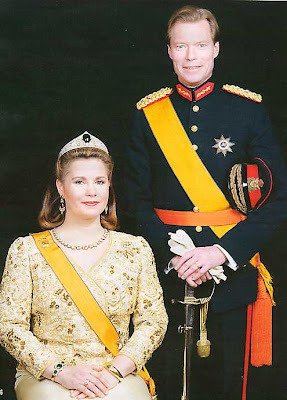 Just announced: We are supposed to pray for the Grand Duke of Luxembourg. The Grand Duke of Luxembourg is one of the last royals, real royals, left in Europe who still has some power. Now he faces being stripped of this power because as a Catholic he is making a stand against euthanasia. He is refusing to sign a bill permitting euthanasia into law. You can read about this unfortunate situation here. That is Prince Guillaume. 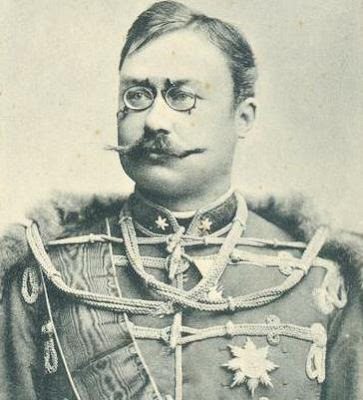 I found him when I was looking for the Grand Duke of Luxembourg, whose name is Henri. Besides his picture I love Guillaume's lineage: "Prince Guillaume was born on 22 April 1852 at Biebrich Palace in Wiesbaden, the eldest son of Duke Adolphe of Nassau and Duchess Adelaide, born Princess of Anhalt-Dessau. His childhood years were spent in Wiesbaden and, after 1866, Vienna." 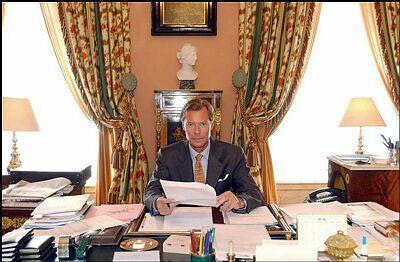 And here is the Duke of Luxembourg at his desk. Wait, don't I see "The Best of Leonard Pennario, Vol. 3" tucked under that corner pile of papers? Well, I could be wrong. But it sounds like something the Grand Duke would listen to. There is something romantic about him risking losing his few remaining powers by doing the right thing. Say a prayer for the Duke, everyone. I missed "the buzz" in this morning's paper ..Whats up? Catholic Church music: I should shut up about this but I'm not going to. The New Age religious rockabilly and other mindless junk is around because it's free of charge and is played, almost always, by amateurs. Art music, as you know, requires training and rehearsal and professionals want, rightly, to be paid for their best work. Pastors and committees would not pay for what they considered elitist. I remember the early 1970s when the conservatories were filled with organ majors who were aiming for careers in church music. I used to think that music in church would improve once they were in the field, but I found out how wrong I was; so many of them were simply overqualified for jobs that required them to be liturgical jukeboxes (I still shudder at the story of one young organist who played the Bach Passacaglia and Fugue in C minor for her audition before two nuns, only to be asked after she finished if she could play "Immaculate Mary"). It's also interesting to note that prior to Vatican II, pipe organs were mandated in Catholic churches. A lot of trained organists bailed out of the field when they saw the pitiful electronic squawk boxes they were supposed to regularly play. OK, I'll stop ranting. I'll end with some news: Frank Scinta has just been appointed director of music at the magnificent Gothic style St. Louis Church, which should improve the choral music there one thousand percent.